Sand mandalas are a temporary art form that has long been integral to the practice of Tibetan Buddhism. The entire process of creating and then destroying the large pieces has symbolic importance for monk practitioners. The mandala has been used in many ancient practices as a way to meditate on life and the self. Early Tibetan monks used mandalas as tools to practice conceptualizing enlightenment and the place of deities in the universe. Essentially, the Tibetan mandala represented the house of the deity, who could be considered and appealed to on the way to enlightenment. Early sand mandalas were created through a process of grinding down different colored stones, including many gemstones. While this is an ancient practice, modern Buddhist monks use the same techniques and methods today. Sand mandalas can have a number of meanings, and the shape they take will be based on what deities or principles are being meditated on. In Buddhism, mandalas are symbolic of cleansing and purifying, and the ritual creation and destruction of sand mandalas is an essential component for meditation and connecting with one’s role in the universe. Kalachakra is a Tibetan practice meant to reflect the cyclical nature of time, and the creation of sand mandalas is incredibly important historically. These mandalas take very complex forms, and contain over 700 deities within a variety of geometric patterns. The Vajrapani practice focuses on Vajrapani as chief deity, and is meant to provide focus on maintaining strength during the path towards enlightenment. For contemplating Avalokiteshvara, the deity that promotes compassion, monks have been known to spend days chanting and building a symbolic divine palace. Sand mandalas can take up to a month to create due to the controlled process of placing a grain of sand at a time. Typically an entire team of monks will work on a mandala, starting at the center point and slowly working together to build outwards. 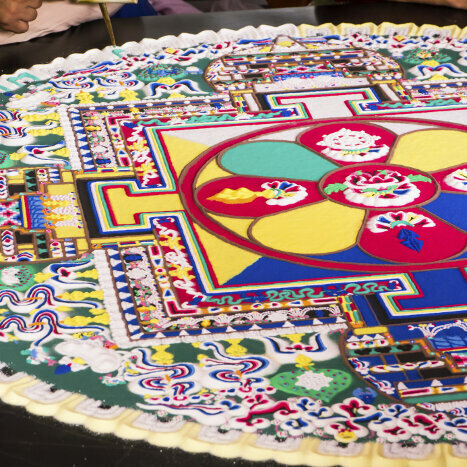 The first step in building a mandala is for a monk to decide on the final form it will take, and for a series of purifying chants and rituals to be performed in the area it will be placed. The monks initially trace out the shape and structure using rope or chalk. In a very slow process, small grains of sand are placed in different areas to slowly build up the geometric image using a tool called a chakpur, which is a small funnel that uses vibrations to slowly drop grains of sand. Once completed, the mandala becomes an object for contemplation, and it is duly consecrated. However, it is then strategically dismantled as part of the cleansing process. 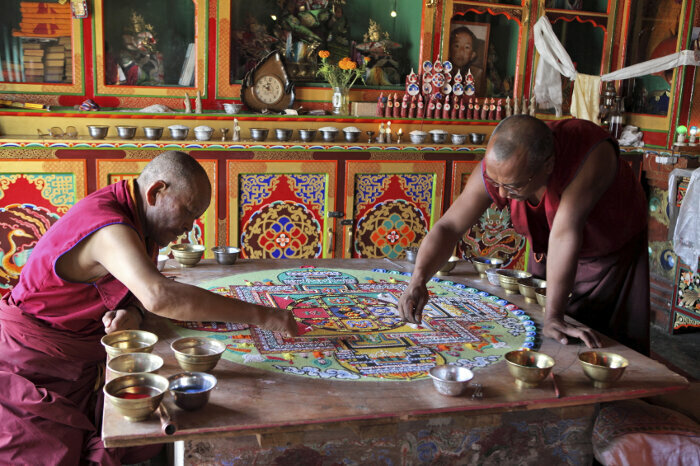 The fleeting nature of sand mandalas is key to their purpose and meaning in Tibetan Buddhism. Equally as important as making the mandala is the process of destroying it. This typically follows a highly ritualized course of action. The process of building a beautiful object and then destroying it is meant as a meditation on the impermanence of life. Each area of sand is slowly removed and collected in jars, and then monks transport the sand back to a body of water and release it. This is a symbolic representation of the connection between nature and life. Making a sand mandala does not have to be on the same scale as those of Tibetan monks, but it can be an easy way to provide focus and meditation in a home environment. Following the same process as the monks, after deciding on the form, place an outline using chalk. Adapt the straw to make a small funnel towards the end, and allow the sand to slowly move through into the areas laid out. Use the brush to help keep areas clear of sand and make lines straight. The key to remember when making a sand mandala is that the process of creating and building the piece is the true meaning behind them. While many take beautiful forms when completed, the image is not the final goal. After the image or design has been created, contemplate the time and effort that went into it. Reflect on the concentration needed and breathe out, dispersing the sand and releasing concerns, connecting with the larger universe.